Sneak in a quick but utterly romantic getaway at one of these luxurious venues, awarded the top 10 best hotels and resorts in Southeast Asia by World Luxury Hotels Awards 2018! Sometimes the occasion calls for a short getaway. When you plan to pop the question of a lifetime, need a break from the stress of wedding planning, or want a great venue for a minimoon, hopping on a short flight to a nearby country could be just the ticket. And when you stay in a luxury hotel or resort, a holiday to Southeast Asia can be just as novel an experience as one to an exotic destination. Recognised for their world-class service and indulgent facilities, these 10 luxury hotels and resorts have been crowned the best in Southeast Asia at the World Luxury Hotel Awards 2018. Be treated like royalty at one of these luxurious venues and make your vacation so much more memorable. Let the beautiful oceanfront views, private pools, and opulent suites make your proposal unforgettably romantic, or ensure your getaway is the pampering respite you need. An exclusive beach retreat in a serene seaside setting, The Surin Phuket is located on the island’s finest white sand beach on the west coast of Phuket Island. 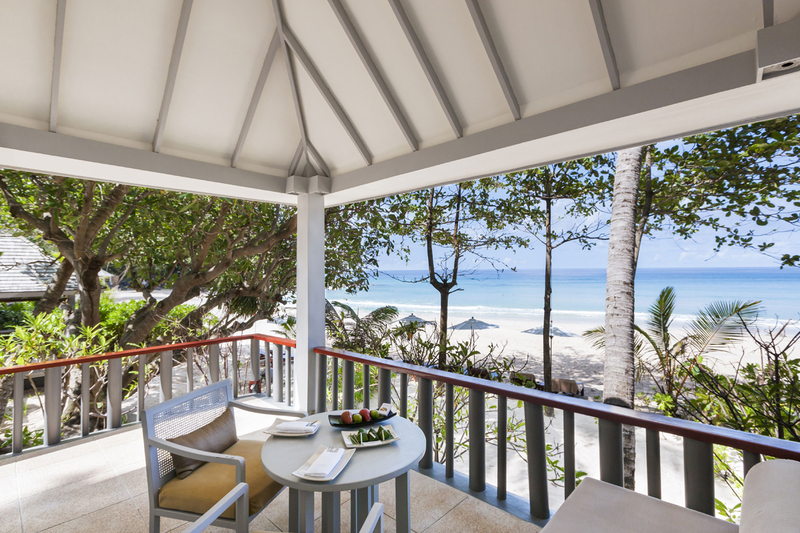 Indulge in a romantic stay in one of the beachfront cottages or suites, where you are steps from the white sand. Lounge and enjoy the views of the turquoise sea and forested hills from your outdoor terrace for the ultimate in Southeast Asian seaside serenity. At The Raweekanlaya Bangkok Wellness Cuisine Resort Bangkok, you’ll be getting a taste of palace life. Originally built in the late 1880s as the residence of the Royal Governess of His Majesty King Vajiravudh, Rama VI of Thailand, and based on the remnants of the former Thewet Palace, the urban resort blends the classical heritage of Siam with contemporary luxury. After a day of shopping and feasting in Bangkok, return to your resort and relax in an oasis of tranquil trees and birdsong right in the heart of the city. Nestled among a rolling green landscape 1,200 metres above sea level, Onsen@Moncham is an exclusive and luxurious cultural retreat where you can you experience a harmonious blend of Japanese onsen rituals and Northern Thai culture. Pamper body and mind in one of the indulgent guest rooms and suites, and become one with nature as you stroll the beautiful gardens and soak in the mountaintop views. Live the high life at the luxurious, five-star Tower Club at Lebua in Bangkok, where spacious suites on the the 51st to 59th floors offer incredible views of Bangkok and the Chao Phraya River. Indulge in one of many rooftop restaurants and bars, or be spoiled with a sumptuous atmosphere and unlimited privileges at the Tower Club Lounge on the 52nd floor. Passionate about Vietnamese art, culture, and heritage, Apricot Hotel is a new boutique luxury hotel designed in a neo-classical style and located on the shores of the historic Hoan Kiem Lake in Hanoi. Admire original art pieces by Vietnam’s finest artists, soak in the panoramic views from the rooftop swimming pool and panoramic fitness centre, or simply pamper yourselves in the elegantly appointed rooms. A convenient three-hour drive from Saigon, Allezboo Beach Resort & Spa offers beachfront luxury on one of Vietnam’s most beautiful private beaches on the South China Sea. Indulge in freshly caught seafood, or book a treatment at Lotus Spa, which offers a range of massages, facials, manicures, and other services to pamper you from head to toe. For a truly romantic trip, enjoy perfect privacy in a honeymoon villa on the beach with your own pool. A five-star luxury boutique resort on the beautiful Phu Quoc Island, Salinda Resort is designed to blend seamlessly into the island’s natural elegance and beauty to offer guests a taste of the alluring island life. Explore the beautiful gardesn, enjoy relaxing spa treatments, and take in stunning views of romantic sunsets with your significant other, right from the comfort of your suite. Eco-conscious travellers will love Vacala Bay, Fiji’s first 5-star solar-powered eco resort, carefully designed with natural materials. As the only guests of the resort, you can romance your other half in your own private paradise in the stunning ecologically sustainable villa, where the rooms open up to incredible ocean views of Taveuni, the Garden Island of Fiji. Take a dip in your private infinity pool, sail on the resort’s yacht, discover Fiji’s premier kiting spot, and let your personal chef delight your palate. An exclusive women’s only retreat, Escape Haven Bali in Bali, Indonesia, is a luxury wellness journey you can take together with your bridesmaids. Be nurtured and pampered with transformative, custom-tailored packages that include surfing, yoga, healing, ayuvedia, or fitness retreat programmes to nourish your wellbeing and leave you glowing and ready for your big day. For those planning to fill their retreat with shopping and leisure, a spacious suite or loft at Discovery Primea in the Philippines’ Central Business District would be a great place to stay. Be spoilt for choice at the luxury malls near the hotel, explore weekend markets and food jaunts, and return to a comfortable home away from home where you can enjoy a dip in the infinity pool, a treatment at the spa, or a drink in the stately whiskey and cigar bar. Credits: Images courtesy of World Luxury Hotel Awards. Feature image of The Surin Phuket.